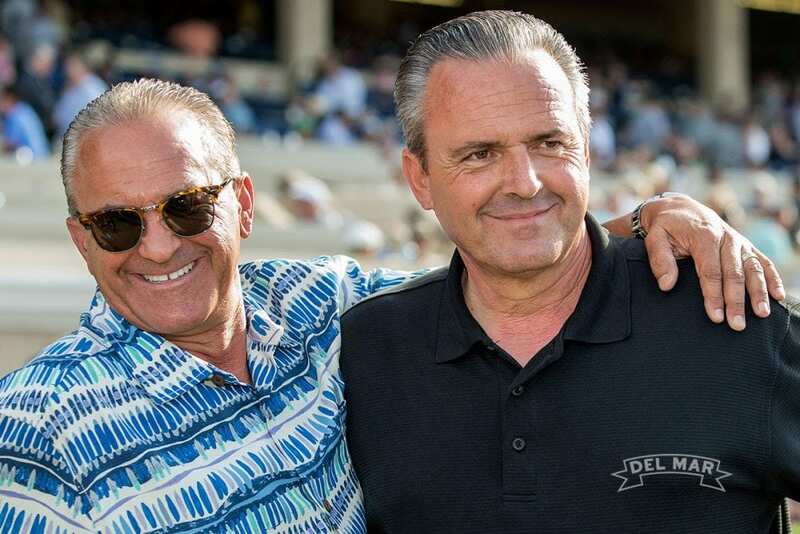 For the fourth time in the past six years, Kosta and Pete Hronis were Del Mar owner champions after yet another stellar summer at the shore for the brothers from Delano, CA. The pair, who fly their silks under the name Hronis Racing, won a meet-leading total of 11 races along with $1,277,954 in purses, proving best in both departments for the second year in a row. Previously, they had been leading owners at the shore oval in 2014 and 2013, and had been in the top five in both 2016 and 2015. The Hronis' big gun at the session was their star Accelerate, who turned in a record-breaking performance in the $1-million TVG Pacific Classic, scoring by 12-1/2 lengths in the Grade I mile and a quarter. The brothers also unveiled a superstar in waiting in the double stakes winner Catalina Cruiser, who took honors in the San Diego and Pat O'Brien at the session. Both horses are expected to be major factors in this year's Breeders' Cup. This entry was posted in People and tagged accelerate, catalina cruiser, Del Mar, del mar thoroughbred club, hronis racing, kosta and pete hronis, Kosta Hronis, leading owner, owner title, Pete Hronis by Del Mar Thoroughbred Club. Bookmark the permalink.